The exhibition was held in the Rare Books Exhibition space, Sir Louis Matheson Library, Monash University from 19 December 2002 - 5 May 2003. 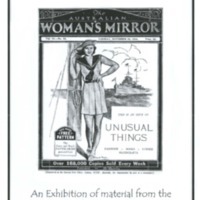 An exhibition of colourful and curious magazines dating from the seventeenth century to the present. Magazines give us an intimate snapshot of the culture and time that produced them - for example, it's not likely that we will see a 2003 edition of New Idea repeating their November 1963 headline: "101 ways to be a happy housewife! ".